Georgetown's Privacy Center today hosted a half-day forum on the Supreme Court's landmark privacy ruling in Carpenter v. United States. 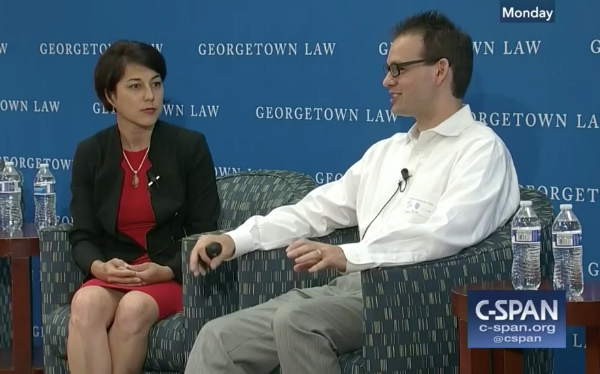 The forum, which was broadcast on C-SPAN, brought together leading privacy experts and practitioners, including Nathan Freed Wessler, attorney for Mr. Carpenter, and Georgetown Law Professor Laura Donohue, whose Fourth Amendment scholarship was heavily cited in the Court’s dissenting opinion. The day began with a technical primer on cell site location technology by Professor Sibren Isaacman. It followed with a policy discussion between Mr. Wessler, Professor Donohue and Professor Stephanie Pell, a former Hill staffer; and location privacy expert at West Point’s Army Cyber Institute. The forum ended with a discussion about the practical implications of the Carpenter decision featuring Matt Mitchell, a digital safety and privacy expert, Jason Downs, a criminal litigation expert, and Maryland prosecutor Todd Hesel, moderated by Jumana Musa of the National Association of Criminal Defense Lawyers. Georgetown's faculty have been deeply engaged in discussions around the Carpenter case, both before and after the decision came down. One of our Faculty Directors, Prof. Paul Ohm, wrote an excellent analysis of the decision here. You can view Professor Donohue's brief on the history of the Fourth Amendment, cited five times by Justice Gorsuch in his dissent, here. And for a great read about cell site location technology, read this blog post by the Privacy Center's Deputy Director Laura Moy, who worked as an analyst before becoming a privacy lawyer. You can view the video of yesterday's event here.